What is the slip ring? it is the electrical components responsible for the rotating body connection, signal and power transmission, according to the different design theory and structure, slip ring can be divided into several categories: through bore slip ring (i.e. Moflon MT series), capsule slip ring (i.e. Moflon MC and MMC series), pancake slip ring (i.e. 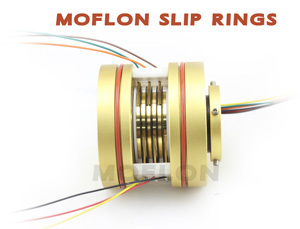 Moflon MP series), fiber optic slip ring (i.e. Moflon MFO series), wind power slip ring (i.e. Moflon MW series), high-frequency slip ring(i.e. Moflon MHF series), ethernet slip rings (i.e. Moflon ME series). The slip ring is usually installed in the rotation center of the mechanical equipment, mainly composed of two parts of the rotating and stationary components. 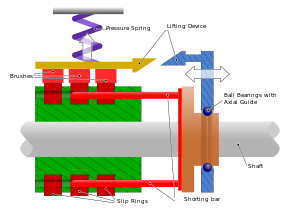 The rotating part connected to the rotation structure part of the device, and then rotational move subsequently, industry professionally called "rotor". 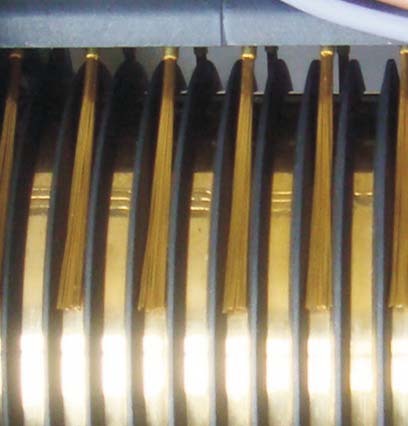 Stationary part connected to the fixed structure of the machinery and equipment, industry professionally called "stator". The slip ring can be widely applied in machinery and equipment, the main advantages of easy installation, small size, and light weight, compact in size. Small volume does not take a place. Slip rings are made up of precious metals, so is high stability, long working life, life of slip ring is usually can reach eighty million turns, rotation speed, work environment and temperature, abrasion, corrosion-resistant and durable have direct relationship with the life of the slip ring. The slip ring can also transmit different signals (such as high frequency, fiber optic, video, high speed data, Ethernet, etc. 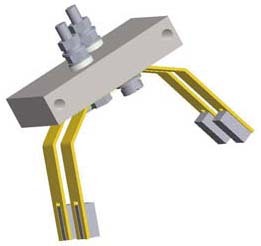 Slip rings rely on elastic overlap principle, and the rolling lap principle selection as a whole, constitute a reliable rotation connectivity system. As long as the slip ring attached to the infinite rotating equipment, it can provide power energy to the rotating body. So that the rotating body while unlimited rotational movement, but also for other sports, or detect the working conditions in the normal rotation state. The slip ring can also be called electric slip ring, rotary connector, electrical rotary joint, collecting ring, electrical slip ring, brush, Moflon slip ring, etc. Dedicated to the unrestricted connecting rotary, transmitting power supply, signal, the stator and the rotor portion, respectively lead wire to connect the power and the electrical terminal of the fixed structure and the rotary structure, and rotation therewith. electric slip ring`s assembly process: wipe grease on the selected two precision bearings, and even with a little precision instrument oil inner and outer of the bearing, assembled the ring body with the bearing and combination bracket together, mounted cover, to ensure that the ring body with the combination of stents in the relative rotation flexibility without catching phenomenon, and then to adjust the concentricity of the cover, assembled two brush on the combination holder separately, and adjust the alignment of the brush wire and ring groove, using rally and multi-meter adjust the contact pressure of the brush wire and ring groove individually, to ensure the pressure values at about 15G, with silk bundled the wire on brush holder assembly. Popularization and application prospects of the slip ring: slip ring has the advantages of multi-loop, high-precision, low noise, long life, reasonable design, compact structure, stable performance, high pressure resistance, electromagnetic shielding performance, the use of reliable, easy installation and maintenance, etc. The main performance indicators have reached the advanced level of similar foreign products can be widely used in the field of civilian and military technology.